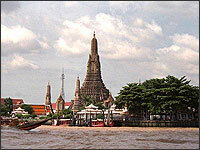 Wat Arunrajawararam Rajaworamahavihara ( Wat Chaeng ) is situated on the west, or Thonburi bank of the Chao Phraya River opposite Wat Phra Chetuphon Wimonmangkhalaram (Wat Pho). 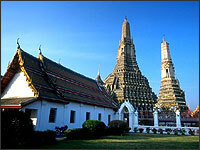 Originally it was named Wat Makok, and later, Wat Makok Nok, as it was paired with Wat Makok Nai (Wat Nuan Noradis). 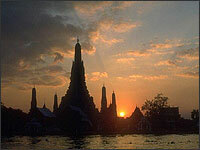 It is said that after fighting his way out Ayutthaya, which was besigned by a Burmese army, King Taksin arrived at this temple just as down was breaking. 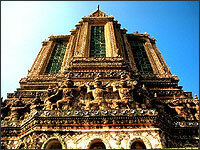 He later had the temple renovated and renamed it Wat Chaeng, the Temple of the Dawn. 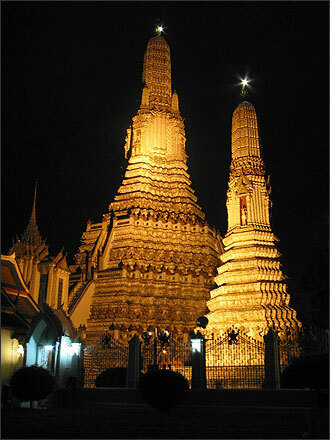 During his reign, which is called the Thonburi Period, WatChaeng was the chief temple, and for time, there were enshrined the Emerald Buddha and another important Buddha image, the Phra Bang, both of which had been removed from Vientiane. 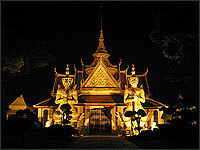 During the Bangkok Period, the temple has been renovated and extended, and it was given its present name by King Rama IV. 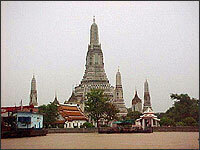 The most prominent structure, which stands in the front, is the phra prang. This is a Khmer-style chedi which is 81 meters high. Adjacent to this at each of four cardinal derection are smaller prang and mondop. All of these structures are decorated with brightly colored pieces of porcelain. 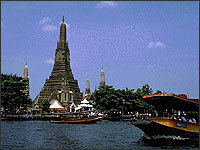 Tourist often climb the stairs of the prang to gain a panoramic view of the city and the river. 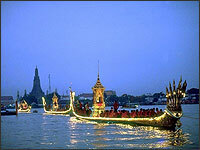 In days gone by when visitors from other lands arrived by sailing up the river, the prang was the landmark telling them they had at last arrived in Bangkok. There is a great deal of interesting art in the temple. 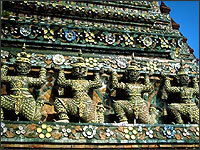 The murals in the phra ubosot were executed by artists during the reign of King Rama V. Around the phra ubosot are many Chinese statues as well as statues of elephant, and near its entrance are the statues of Nai Nok and Nai Reuang, two men who immolated themselves to attain anlightenment.